Jamie and Jennifer Linn of Elk River have a special spot in their hearts when it comes to the 13 exchange students whom they have hosted throughout the years. Jannis, who came all the way from Germany, is the first exchange student they welcomed into their home back in 2008. They have been very dedicated hosts and advocates ever since. Jamie and Jennifer also have three children who love getting to meet new friends from around the world. Austin is 23, Thorson "Thor" is nine and Noelle is seven. “Our children have been given a gift. They've had an opportunity to learn firsthand about different cultures, from language, food, and traditions,” said Jennifer. Initially their love for travel sparked interest in hosting exchange students. The Linns have a huge interest in learning about new cultures which made hosting an easy decision for their family. Brazil, Germany, Italy, Spain, Sweden and Mexico are the six countries from where the students have traveled. “Miles, language, and cultural differences sometimes make us feel worlds apart from each other. But when you welcome an international high school exchange student into your home, you quickly discover they become family. “Through conversations and experiences at home, school, and throughout the community, you will learn how close together worlds apart can really be,” Ayusa International. The Linn Family is now hosting Giulia, who is from Italy. Giulia is a senior in high school. 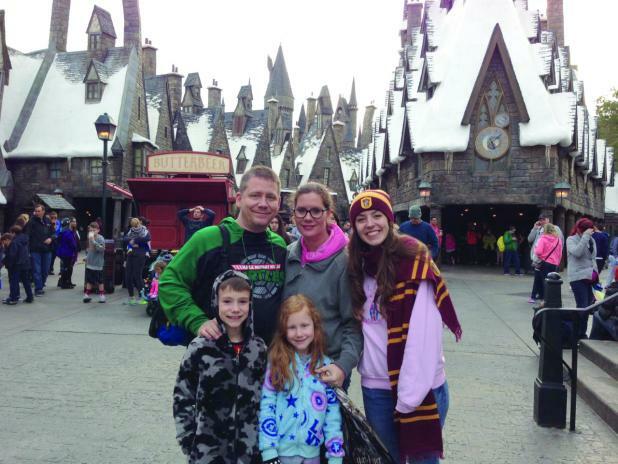 Since Giulia's arrival to their home Dec. 30, the Linn family has traveled to Florida where she was able to enjoy Walt Disney World, Universal Studios and Islands of Adventure. The family also has upcoming trips to Missouri and South Dakota. Giulia said in an interview, “When I heard I would be placed in MN on Oct 18 it was a huge surprise. My sister spent time in St. Paul the summer prior. What a coincidence!” “I began looking for more information about where I would be living for the next five months. When I saw how cold it would be here I have to admit I was scared. Luckily now I have become somewhat accustomed to the temperatures.” said Giulia “My host family has made me feel right at home from the first day. They’ve hosted many students from different countries and show a house full of all these memories and cultures. I’ve enjoyed my time here in America very much and know this will continue. I learn something every day and really LOVE American food! Every new discovery is an awesome experience!” said Giulia. Jamie and Jennifer have traveled to Europe several times and said that their recent trip was one of the most memorable as they were able to spend time with all three of their Italian students and families. “It was an amazing experience,” said Jennifer. The Linns did not expect the amount of appreciation they received from the families of the students they have hosted. Only then, did they realize the impact they had made on the kids as well as their families. “The love for each of them wouldn't end the day they returned home! It's never Good-bye... instead, see you later!” said Jennifer. Jamie and Jennifer are very thankful they are able to stay in contact with all of the students and families they have hosted. “We feel VERY blessed to call them our children. They bring so much joy to our family and lives that we couldn't imagine it without them,” said Jennifer. Jamie is an engineer and Jennifer is a photographer from Elk River. She also is a local coordinator for Ayusa international. Jennifer works daily to find loving families that want to make a difference! Ayusa is a non-profit organization dedicated to promote global learning and leadership through foreign exchange, study abroad and leadership programs for high school students from the U.S and around the world.